NEWARK — If you have a child (especially a boy), you likely know what Minecraft is. This computer game is all the rage among the younger set. Played on multiple platforms (computers, Xbox, Kindle, iPad, PlayStation, etc. ), the game allows players to build three-dimensional buildings and worlds from textured cubes. Players can explore, craft, fight and gather resources in the game. Think of it as advanced Legos in the computer age. 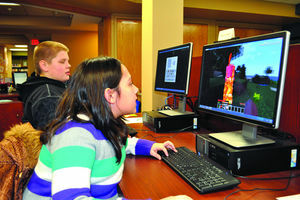 And now local Minecraft fans can meet once a month at the Newark Library to share their passion. Youth Services Director Krystina Hardter launched the club last Tuesday evening. She did so because she’s seen firsthand in the library how popular the game is. Young patrons ask for Minecraft books, but the shelf where the series is kept is often empty. Hardter had set aside a table with Minecraft coloring sheets and instructions on how to make three-dimensional paper Minecraft figures, but the four young patrons who braved the snow last week were more intent on getting on the computers and playing the game itself. Since some of them had played on different platforms, there was a learning curve as they started building on the computer. Questions flew as the young library patrons started clicking away with their computer mice. “How do you eat?” “How do you build a ladder?” “How do you make a door?” were among the queries being traded. Anthony Merced, 7, was in the water and afraid he would drown. He asked his classmate Ryan Hinks, also 7, what to do. “Press the space button to float,” Ryan answered. The Newark youngster has been playing Minecraft since he was 6, usually on his Kindle tablet. He was a little distracted to explain the game in depth, especially to an obviously clueless questioner. “It’s very, very complicated to explain. You just mine and then you craft,” said Ryan, noting everyone in his family plays except his parents. His mother, he added, has said she might have to learn just to be able to interact with her children. As the children pressed their faces close to the screens and talked to both the computers and each other, Hardter and Youth Services Librarian Caitlin Simonse mingled about. They helped as they could and asked plenty of questions. Blake Aldrich, 11, said he has been playing Minecraft “a long time now” and called it his favorite game. As Hardter complimented his work, she wondered why his house was built underground. “It’s most common for houses to be built underground because it’s safest,” Aldrich said. “Who do you need to be safe from?” Hardter asked. “Zombies, creepers, and skeletons,” the kids answered. Despite asking the others, Blake still had trouble constructing a ladder. Hardter pulled out her phone, loaded up a YouTube video and showed him how. Meeting kids where they are at — in the library — is certainly a goal of hers. “My hope is to start them younger and build their love for the library so by the time they get to the high school it’s still cool,” Hardter said.